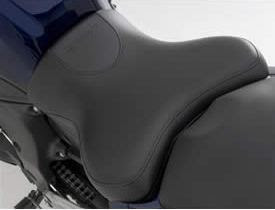 This new FZ1 Gel Seat will extend your comfort level for those long long rides. Gel is weaved through out the seat using a unique carbon fibre pattern to provide a greater level of comfort in key areas of the seat. The FZ1 logo is featured on the seat so you know this Genuine Yamaha accessory will replace the stock front seat without any modifications. Fits model year 2006, 2007 and 2008. To search for your FZ1 parts such as tail lights, fenders, seat, sub cowling, etc. and view microfiche browse our Yamaha parts pages. I've ridden 2,300 kilometers on a long weekend through the blue ridge parkway in Virginia on my gel seat, and I wouldn't ride without one now. Larry.